There has been significant advancement in various aspects of scientific knowledge concerning the role of cerebellum in the etiopathogenesis of autism. In the current consensus paper, we will observe the diversity of opinions regarding the involvement of this important site in the pathology of autism. 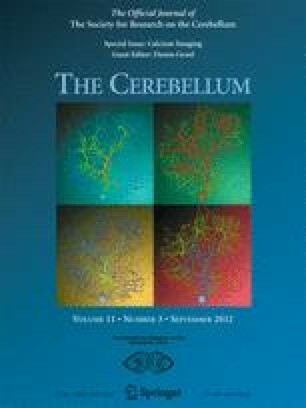 Recent emergent findings in literature related to cerebellar involvement in autism are discussed, including: cerebellar pathology, cerebellar imaging and symptom expression in autism, cerebellar genetics, cerebellar immune function, oxidative stress and mitochondrial dysfunction, GABAergic and glutamatergic systems, cholinergic, dopaminergic, serotonergic, and oxytocin-related changes in autism, motor control and cognitive deficits, cerebellar coordination of movements and cognition, gene–environment interactions, therapeutics in autism, and relevant animal models of autism. Points of consensus include presence of abnormal cerebellar anatomy, abnormal neurotransmitter systems, oxidative stress, cerebellar motor and cognitive deficits, and neuroinflammation in subjects with autism. Undefined areas or areas requiring further investigation include lack of treatment options for core symptoms of autism, vermal hypoplasia, and other vermal abnormalities as a consistent feature of autism, mechanisms underlying cerebellar contributions to cognition, and unknown mechanisms underlying neuroinflammation. (1) Dr. S. Hossein Fatemi appreciates the excellent technical assistance by Rachel Elizabeth Kneeland in editing of this consensus paper, and the critical review of the manuscript by Mr. Timothy D. Folsom. Research support for Dr. Fatemi’s work is from the Eunice Kennedy Shriver National Institute of Child Health and Human Development (5R01HD052074-05 and 3R01HD05207403-S1 supplemental grant), as well as the Alfred and Ingrid Lenz Harrison Autism Initiative; (2) Research support for work by Drs. Kimberly A. Aldinger and Kathleen J. Millen is from the Autism Speaks Foundation; (3) Research support for work by Dr. Paul Ashwood is from Autism Speaks Foundation, the Jane Botsford Johnson Foundation, National Alliance for Research on Schizophrenia and Depression, and National Institute of Neurological Disorders and Stroke R21HD065269, and the Peter Emch Foundation is gratefully acknowledged; (4) Research support for work by Drs. Margaret L. Bauman and Thomas L. Kemper is from the Nancy Lurie Marks Family Foundation, by NINDS (NS38975-05) and by NAAR/Autism Speaks. We would also like to acknowledge and thank the many families whose generous donation of postmortem brain tissue has made this research possible; (5) Research support for work by Drs. Charles D. Blaha, Price E. Dickson, Dan Goldowitz, Loren A. Martin, and Guy Mittleman is from Cure Autism Now, Autism Speaks, and R01 NS063009 from NIH/NINDS; (6) Research support for work by Dr. Gene Blatt is from the Eunice Kennedy Shriver National Institute of Child Health and Human Development (5R01HD039459-06) and The Hussman Foundation; (7) Research support for work by Drs. Abha Chauhan and Ved Chauhan is from the Department of Defense Autism Spectrum Disorders Research Program AS073224P2, the Autism Research Institute, the Autism Collaboration (autism.org), and the NYS Office for People with Developmental Disabilities; (8) Drs. Stephen R. Dager, Annette M. Estes, and John P. Welsh would like to thank Elizabeth Kelly for assistance in preparing their manuscript. Research support for their work is from Autism Centers of Excellence (NICHD P50-HD055782), Collaborative Programs of Excellence in Autism (NICHD #HD35465 NICHD, RO1-HD055741), ACE Network (NICHD RO1 supplement HD05571), American Recovery and Reinvestment Act (NICHD R01-HD065283), and National Institute for Neurological Disorders and Stroke (NINDS R01-NS31224-18). Support from Autism Speaks and the Simons Foundation is also gratefully acknowledged; (9) Research support for Dr. Detlef H. Heck is from NIH grants RO1NS060887 and R01NS063009. The content of this publication is solely the responsibility of the author and does not necessarily represent the official views of the NIH; (10) Research support for Drs. Bryan H. King, Sara J. Webb, and John P. Welsh is from the Eunice Kennedy Shriver National Institute of Child Health & Human Development (P50 HD055782; King/Webb) and the National Institute for Neurological Disorders and Stroke (R01 NS31224-18; Welsh). We want to thank the families of and individuals with autism who have participated in research; (11) Research support for work by Drs. Matthew W. Mosconi and John A. Sweeney is from the Autism Center of Excellence Award Number P50HD055751 from the Eunice Kennedy Shriver NICHD, NIMH Grant 1K23MH092696, and Autism Speaks Grant 4853. Dr. John Sweeney consults with Pfizer and Takeda and has received a grant from the Janssen Foundation. The content is solely the responsibility of the authors and does not necessarily represent the official views of the funding institutes; (12) Research support for work by Dr. Antonio M. Persico is from the Italian Ministry of University, Research and Technology (PRIN 2006058195 and 2008BACT54), the Italian Ministry of Health (RFPS-2007-5-640174), Autism Speaks (Princeton, NJ), the Autism Research Institute (San Diego, CA), and the Fondazione Gaetano e Mafalda Luce (Milan, Italy). Rossignol DA, Frye RE. Mitochondrial dysfunction in autism spectrum disorders: a systematic review and meta-analysis. Mol Psychiatry. 2011; (in press), doi: 10.1038/mp.2010.136.